Writer Rick Remender is very concerned with characterization and differentiating his cast’s points of view. Even the bad guys. Remender gives his villains (The Apocalypse Twins and the Four Horsemen) real and true perspectives, personalities and believable goals. As readers of good-vs-evil fiction, we understand that villains have goals, yes. But they are mostly stupid goals. Mostly goals that aren’t very dramatic and serve only as a pretense to giving the heroes someone worthy of punching or shooting. 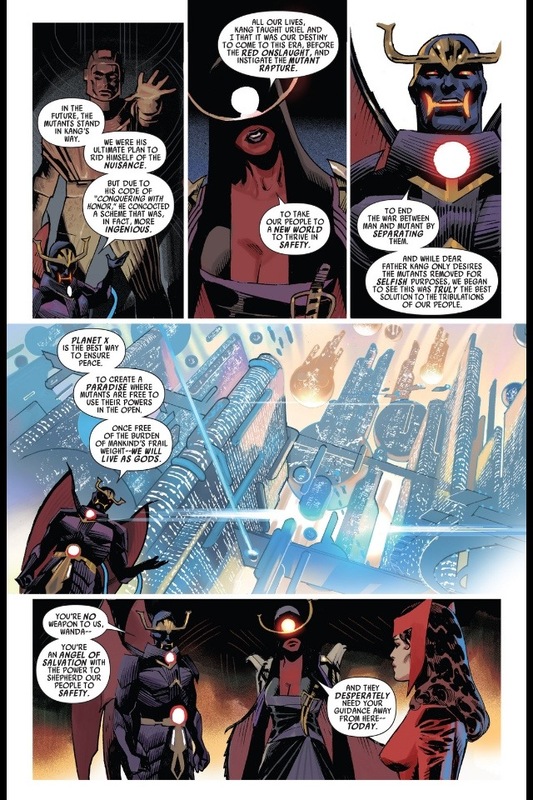 In Remender’s Uncanny Avengers, just as in the “Dark Angel Saga,” we see villains whose beliefs and goals feel formed from a unique perspective. The points of view of these characters are informed by the structure of the fictional world in which the story takes place. Even when the comic book social politics are absurd, Uncanny Avengers runs with that absurdity and reveals to us the type of people who would live in such a world and how they might seek to fix it. Villains see themselves as heroes. Even allowing that The Apocalypse Twins are probably at least partially lying about their intentions as outlined in issue 11, they still have enough truth to their maybe-lies to think of them. I’m willing to believe that these characters do believe their words. Because that’s what makes them more interesting. It makes their promise of a better world more dangerous because it is plausible that people (characters) would actually want that goal. When big villains show up promising to eat the world or burn civilization to embers, it’s no wonder that every character who is around stands up and fights back. But a pair of characters offering a better, safer world: that has the potential to put characters at odds with themselves and with what they believed about their own values. It’s just a much better conflict. Even the smaller villains are threats As Characters, rather than As Obstacles. In issue number 11, the Horsemen square off against characters who’ve killed them or wronged them in life. Their various pair offs have more dramatic tension than the conflicts other stories might have between let’s say central characters and nameless zombies or robots. Faceless, nameless automatons represent only physical obstacle. What Uncanny Avengers provides readers with is emotional conflicts that intertwine with the physical obstacle. 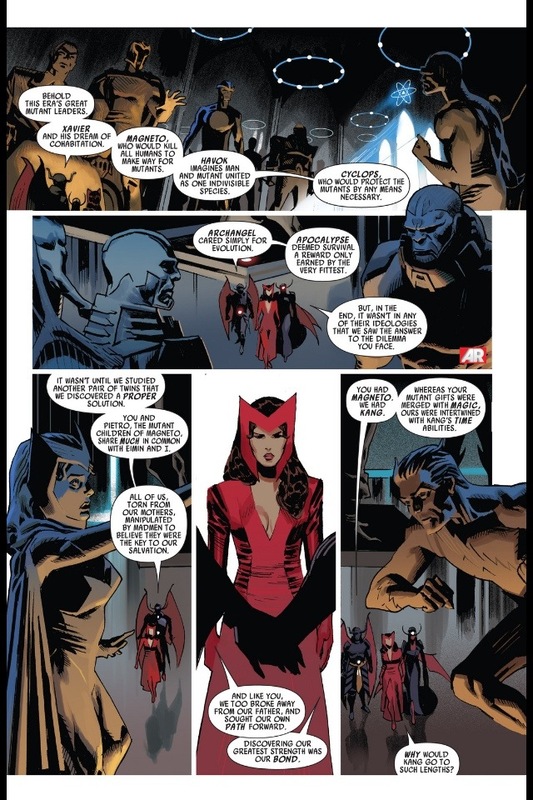 Contrast this storyline of Uncanny Avengers with the Joss Whedon Avengers film. As exciting as the final battle against the Chitauri was in terms of spectacle, the long fight sequences felt as though they were missing something, at least to me. What was missing is a reason to care about the bad guys. In the Avengers film, Loki carries the sole emotional heft of villainy within himself. The Chitauri are pawns, cannon fodder, Hulk chow. Additionally, the S.H.I.E.L.D. high council are too scarcely seen to carry much water as characters. Both the council and the Chitauri represent the anonymity of danger. They represent danger in an abstract sense. It would be bad if “some foreign power” invaded us. It would be bad if “the people sworn to protect us” chose instead to sacrifice us. It would be bad. But neither Chitauri nor S.H.I.E.L.D Council represent more of an emotional conflict the way that the interpersonal dynamics of The Avengers team does. Thematically, The Avengers motion picture is about psychologically isolated people learning to surrender to trust. The enemies are entirely incidental. As good as Tom Hiddleston is at playing Loki, the fundamental story theme would have been the same with Hugo Weaving playing the Red Skull. The thing about artist Daniel Acuña is that while his storytelling is not as action-driven as Jerome Opeña, his colors and tones provide an atmospheric sibling to Uncanny X-Force’s Opeña and Dean White. Acuña makes the story feel credible through an almost impressionist painter style. The details of his action storytelling are basically market-standard in superhero books. His close-up character work is solid but not subtle. His scales are good. Acuña has a way of rendering large environments and the small people inhabiting them in a way that diminishes nothing. Coupled with his color choices and application, he effectively masks what he’s not great at using the skills that he is great at. Given how character driven the story of Uncanny Avengers is, one doesn’t notice a deficit. Perhaps there is none. Just two creators, an artist and a writer, both playing up their strengths and getting good work out of the mixture.